I love notebooks. Do you? I’ve got them in all shapes and sizes and use them for everything. There’s nothing like a fresh notebook to inspire! 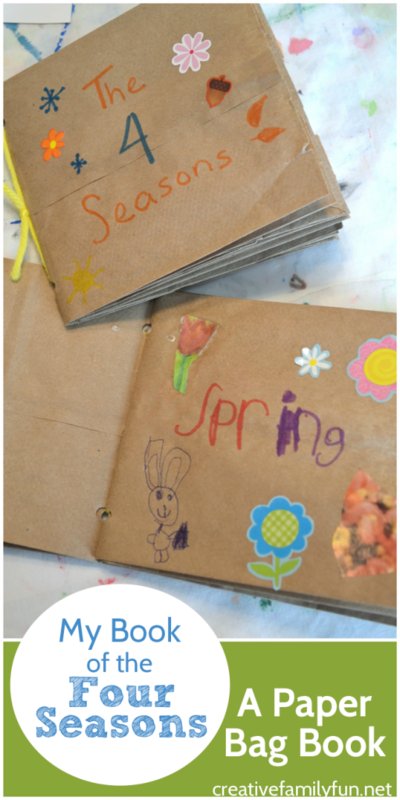 While any notebook is fun, a special homemade notebook is even more fun. 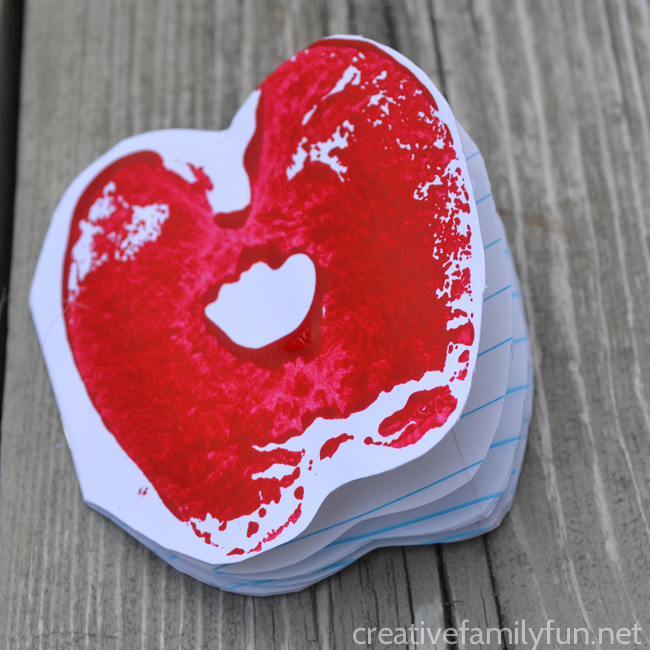 So, we’re going to grab an apple, make some apple prints, and turn them into this cute Mini Apple Print Notebook. What do you think? I think we all need a small pile of these fun mini notebooks. To make these notebooks, you need to start with your apple print. Cut an apple in half vertically, and dry the inside off a bit with a paper towel. 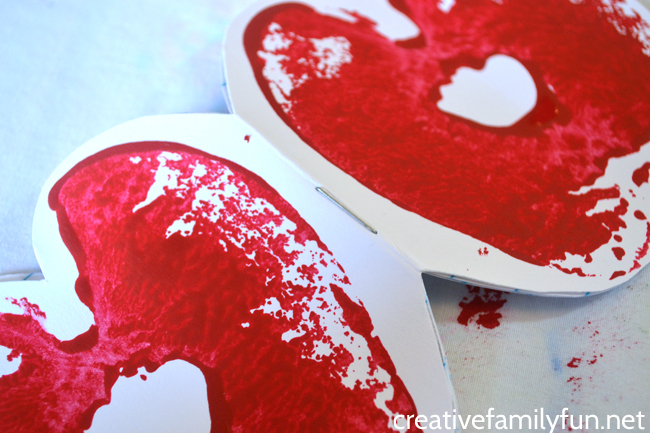 Brush red paint thickly on the cut half of the apple and press it down on your cardstock. 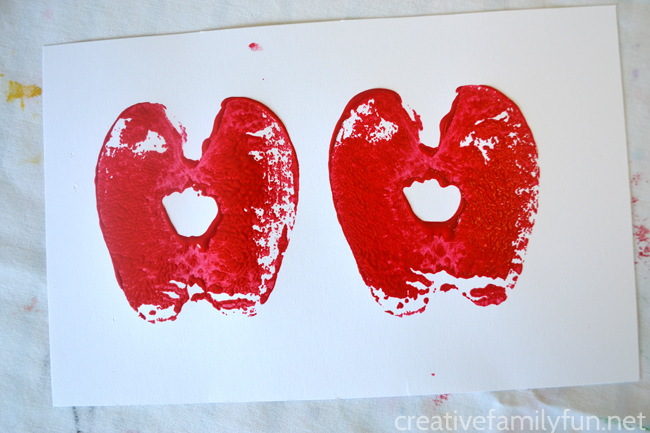 Add some more paint to your apple and make a second apple print next to your first one. Leave a small space between the two prints. See the above photo for an example. Once your paint is dry, cut out the cover of your notebook. 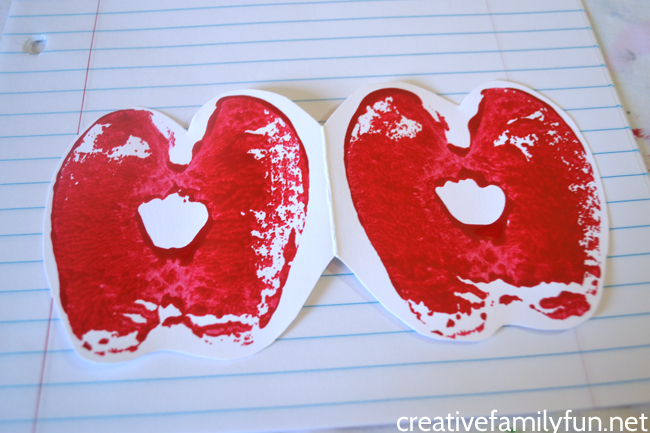 Cut around both of the apple prints in a simple apple shape. Leave the two prints connected in the middle. Fold your cover in half. If you want to trim the edges up a little at this point, you can. 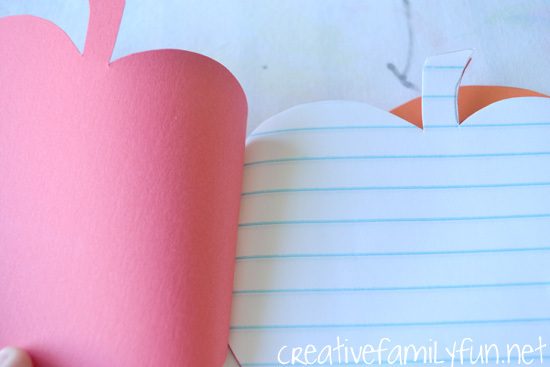 Unfold your cover and place it down on your small pile of notebook paper. I used five sheets of notebook paper, so that when folded, my mini notebook had ten pages. Trace around the entire cover. Cut your notebook paper along the traced lines. Stack your notebook paper with the cover on top and fold all along the middle. Stack it neatly and staple it all together in the middle along the crease (see picture above). Once your mini apple print notebook is put together, you can trim the edges of your inside pages so that everything is neat. You can write about almost anything, but here are some fun apple topics you can write about in your apple print notebook. Write about a trip to an apple orchard. Record your favorite apple recipe (or two). Do an apple taste test and record the results in your mini notebook. Make a list of your favorite apple foods. 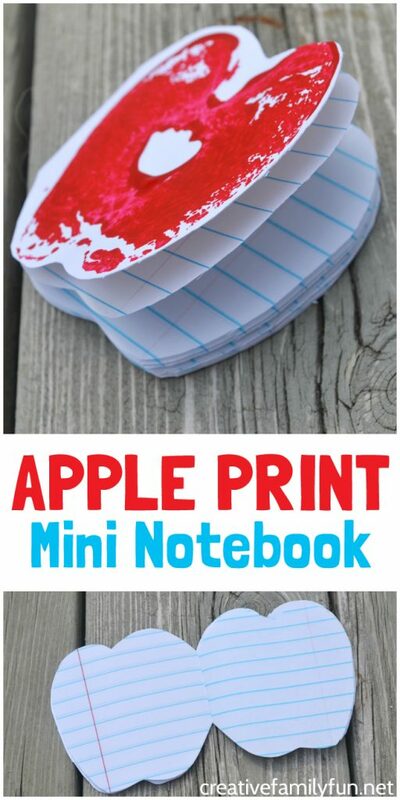 If you enjoyed this Mini Apple Print Notebook, the above photo is perfect for sharing on Facebook, or you can save the photo below on Pinterest. Sometimes, all it takes to get a kid interested in writing is a special book to hold their thoughts. My daughter spends a lot of her time at school writing in spiral notebooks or composition books. So, I thought I’d spark her interest at home with some special fall-themed mini books for creative writing. These Pumpkin and Apple Mini Books are little, so they’re not too intimidating. Plus, they’re filled with lined paper to make writing easier. *Note: You can also use construction paper. It just won’t be as durable as the card stock. 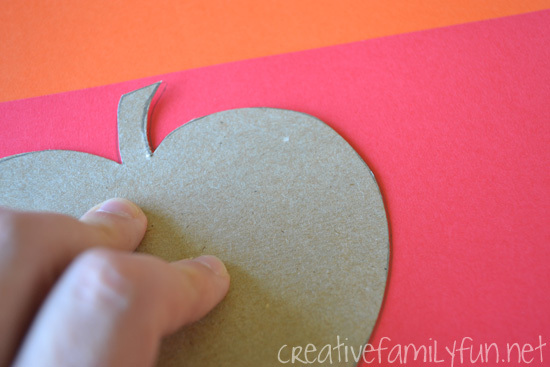 Before beginning, create a pumpkin and an apple template from your cardboard. 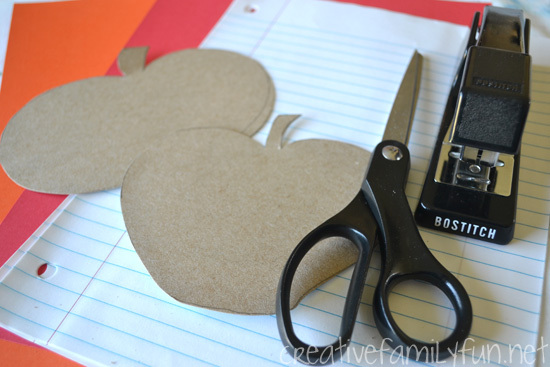 Make it small enough that you can cut two apples (or pumpkins) on each sheet of paper. If you use a template, it will be easy to make sure all of your pages are the same shape and size. If you are unsure of your drawing abilities, search for simple clip art or coloring pages. You should be able to find something online to serve as your template. 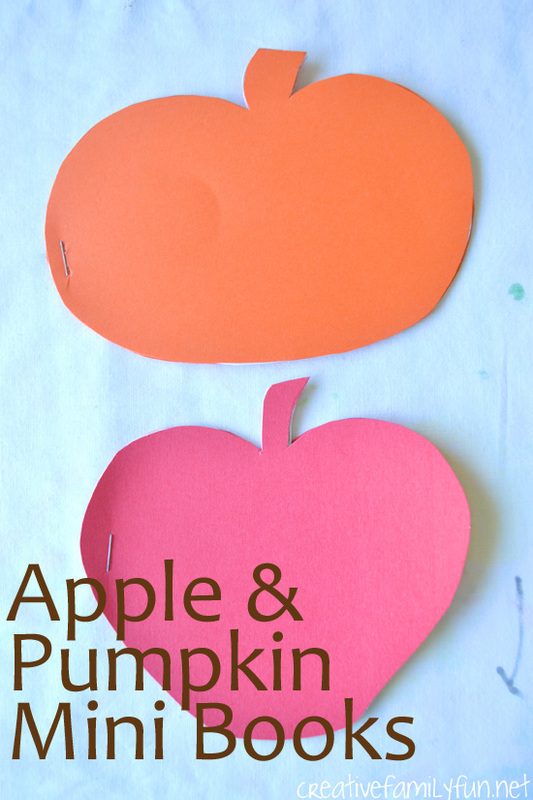 Trace two apples on your red card stock and two pumpkins on your orange card stock. Cut each one out. Next, take 3 sheets of notebook paper per mini book. 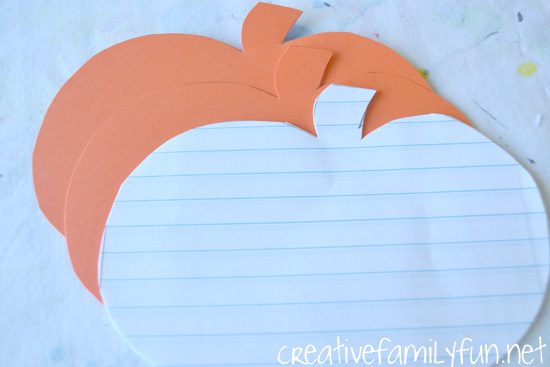 Fold the pieces of paper in half and trace one apple (or one pumpkin) on one side of your folded paper. Now you can cut all 6 pages of your mini book at once. I used this method to save myself some cutting time. 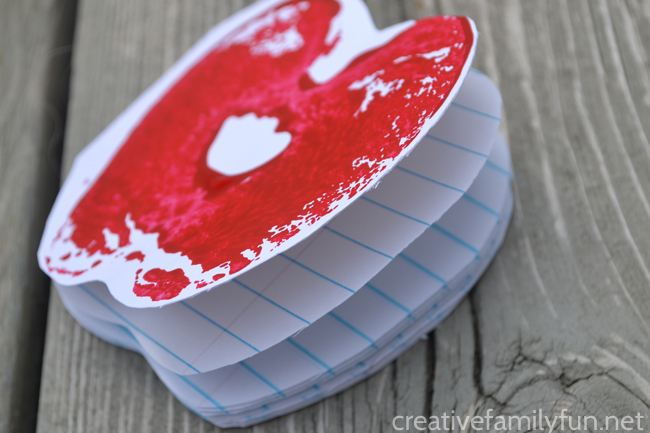 Stack all of your cut-out pieces so that you have a piece of card stock on the top, 6 pieces of notebook paper in the middle, and another piece of card stock on the back. Attach all the pages together with your stapler. I found that one staple on the side of each book did the trick. 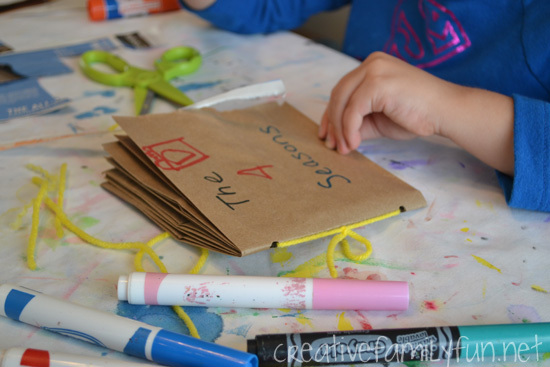 These mini books are very simple to make and an older child should be able to do the process from start to finish on their own. I made the books myself because I wanted to surprise my second grader with a fun writing invitation. 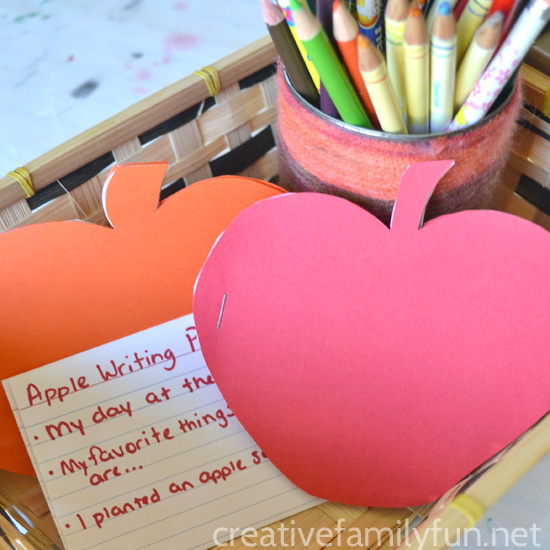 To set up the writing invitation, I added the pumpkin and apple mini books to a small basket with a pencil holder full of a variety of pencils. I also added a couple of index cards with some pumpkin- and apple-themed writing prompts to the basket. I love writing prompts because sometimes the most overwhelming thing about writing is choosing the topic. Writing prompts help narrow down the topics and spark your kid’s imagination. How do you carve a jack-o-lantern? What stories will your kids come up with? Happy writing! 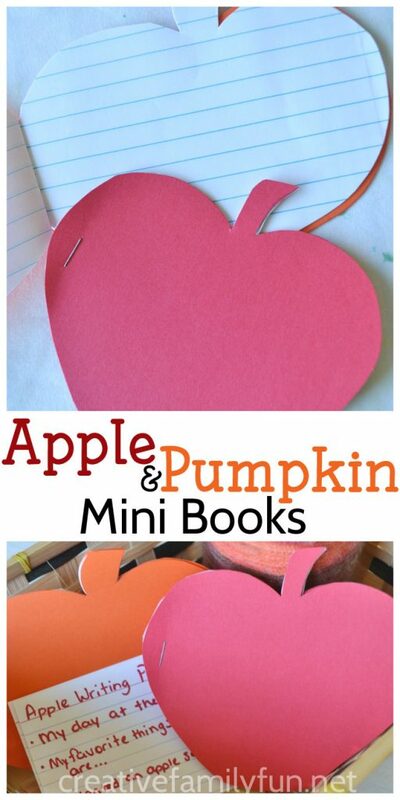 If you enjoyed these Pumpkin and Apple Mini Books, the above photo is perfect for sharing on Facebook. Or, you can share the photo below on Pinterest. It can be fun with you make into a game and when you add a hands-on element. 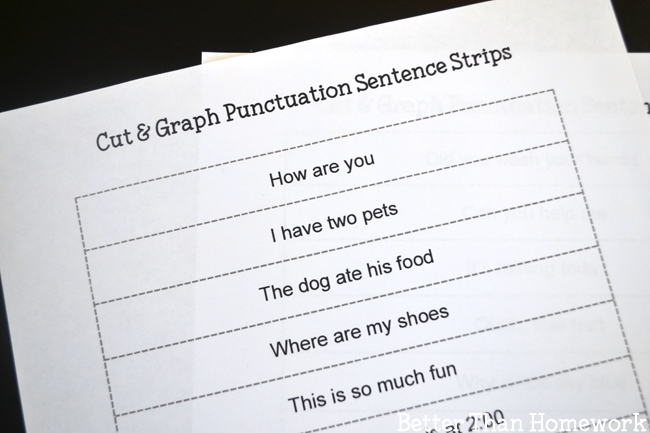 This simple punctuation game with printable cut and graph sentence strips is a great way to add the element of fun. 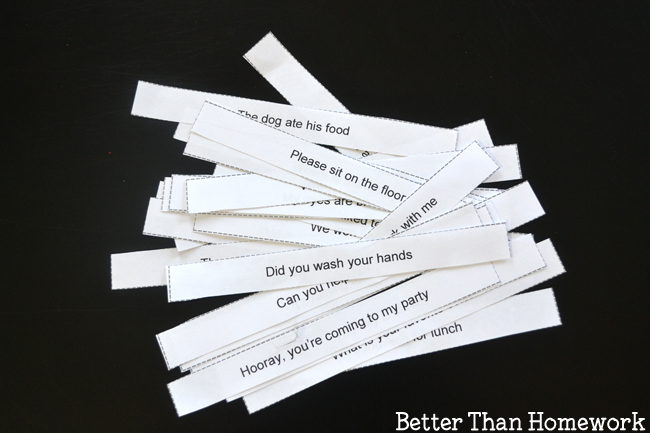 Download and print your sentence strips. They’ll print on two pages of paper. 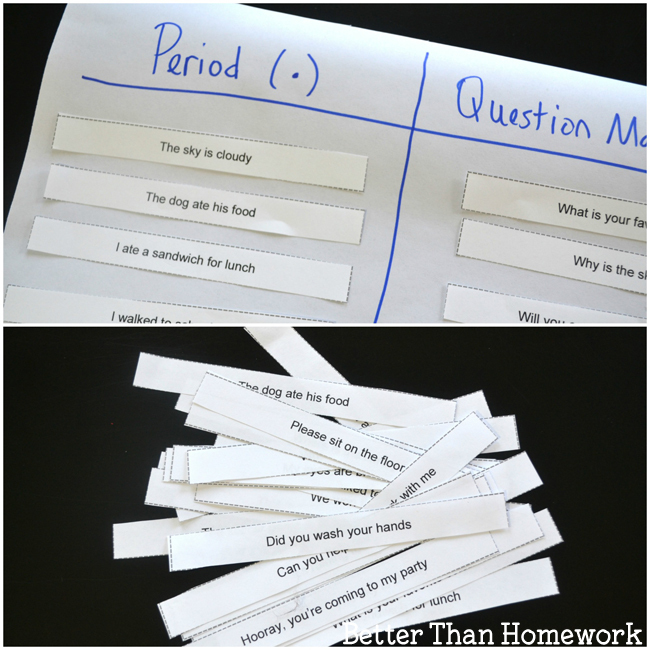 Cut apart each sentence strip. Next, set up your graph. 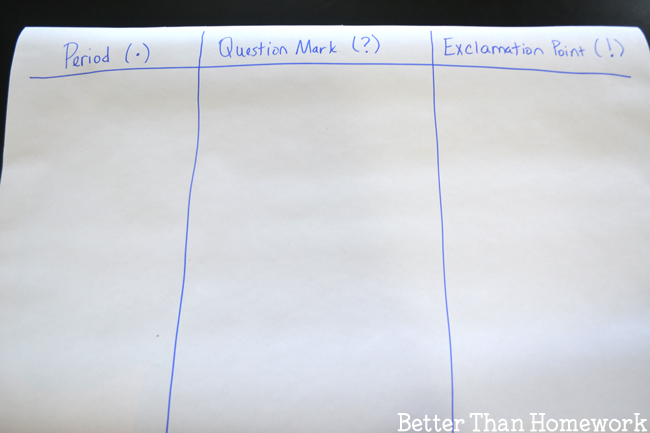 Use a piece of large paper to draw three columns. You’ll want one column for periods (. ), one column for question marks (? ), and one column for exclamation marks (!). This punctuation game is easy. Each strip has a sentence on it that is missing its end punctuation. 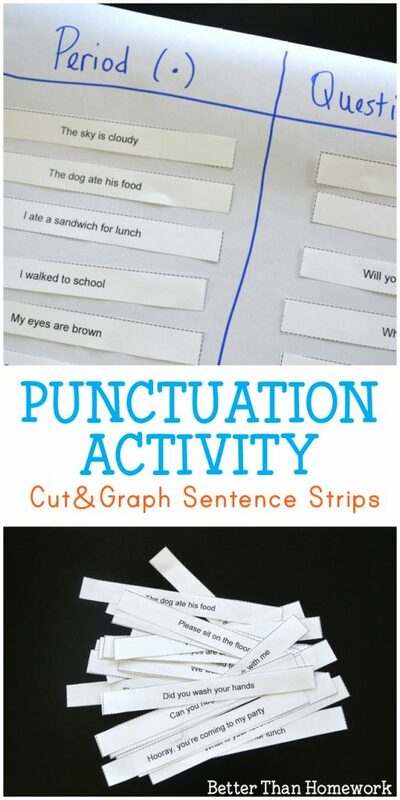 Choose a sentence strip, determine the correct end punctuation, and glue the strip in the correct column. It couldn’t be easier (or more fun)! Don’t have any large paper? Take three sheets of printer paper, one for each end punctuation mark. Glue your strip onto the correct sheet of paper. Or, you can make an impromptu graph anywhere. Make a graph on the floor with painters tape or on a table. You don’t have to glue the strips down, just lay them in the correct column. Play with a large group of kids. 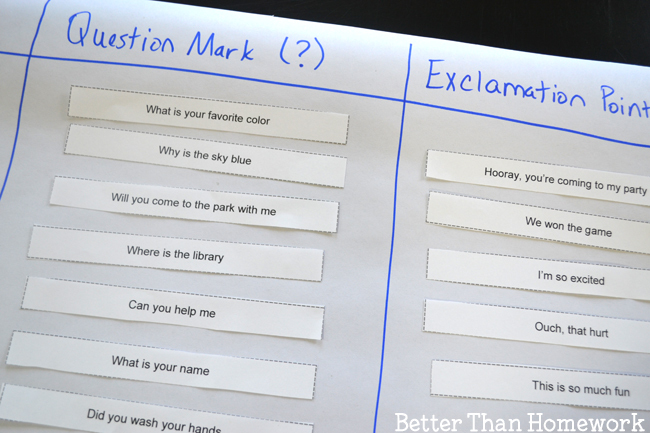 Hand each kid a strip and have them stand in groups for each punctuation mark. Can you come up with a fun variation? If you enjoyed this fun punctuation game, the above photo is perfect for sharing on Facebook. Or you can save the photo below on Pinterest. I’ve stumbled across the idea of a paper bag book several times. Now that I’m working on writing with my oldest and we also plan to do some four seasons projects, that “some time” became now. Yay! We’re going to make a Four Seasons Paper Bag Book. 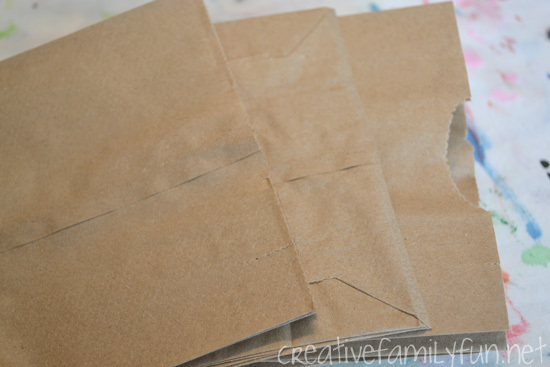 Paper bag books are so much fun to create, plus they’re unique and easy-to-make. And the best part is that they have all sorts of fun pockets for hiding little treasures. Imagine all the fun things you can put in the pockets! We used three paper bags for each book we made. We first folded each paper bag in half. Since one side of the bag is open and the other closed, we alternated the directions of the bags when we put the books together. If you don’t alternate the directions, you’ll have all of your pockets in either the front or the back of the book. Once we had the bags in the order we wanted, we punched two holes along the middle seam of the book. 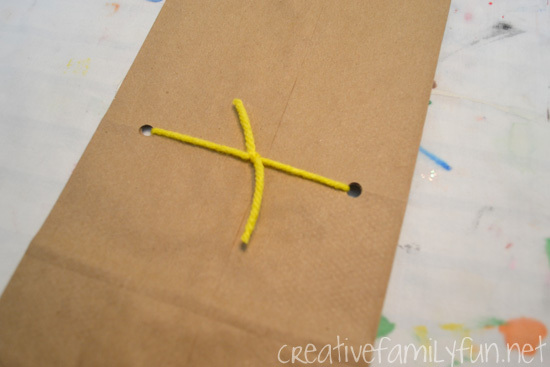 Punch through all three paper bags. We then threaded the yarn through the holes and tied a strong knot in the middle. Special note: If you find your knot does not want to stay tied, add a drop of glue to the middle of your knot. Once it dries, your knot will not come untied. The process of making the book was quick and easy, but it definitely wasn’t the best part. We loaded the table full of supplies, such as markers, stickers, crayons, old magazines, scissors, construction paper, and glue. 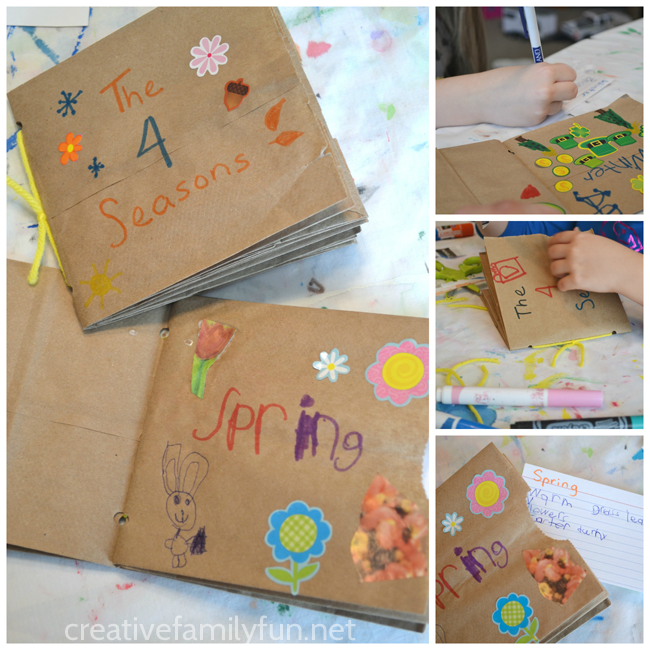 Our goal was to write a book about the four seasons. We used a spread of two pages for each of our seasons. The girls wrote the name of the season and then filled the two pages with images. They used Christmas and Valentine stickers for winter and then drew snowflakes and Christmas trees. They added the sun for summer and lots of flowers for spring. I added an extra writing challenge for my first grader. She used an index card to write words that described each of the seasons. When she was done, she tucked the card into one of the pockets. A few other surprises made their way into the pocket too, such as big stickers and special pictures. Book making is fun! Early writers get to practice their new skill. Older kids can learn to be more comfortable with writing. And, pre-readers get a chance to practice story-telling with pictures. It works for every level. 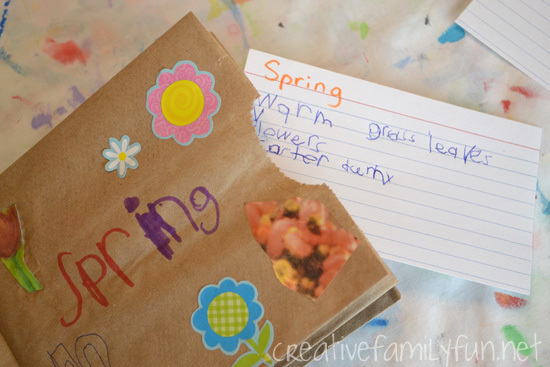 Have fun making a paper bag book with your kids! If you enjoyed this post, the photo above is perfect for sharing on Facebook, or you can share the photo below on Pinterest. Spelling words have been a fact of life for many years. My parents had to study them in school, I did, and so do my kids. It’s important, but that doesn’t have to mean it’s boring. 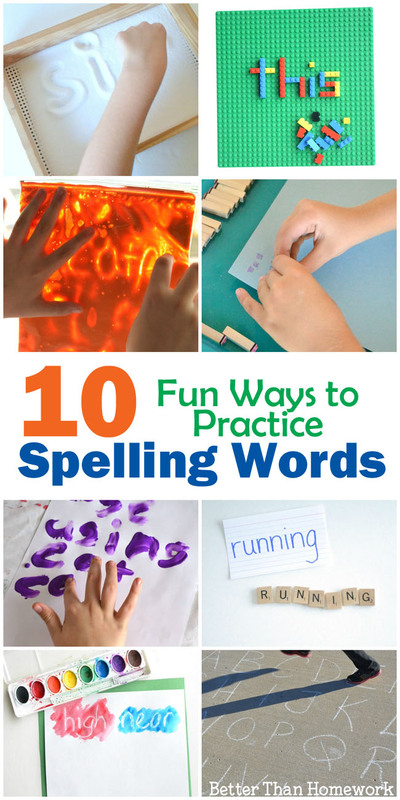 Take these ten ways to practice spelling words. They’re simple; they’re hands-on; and best of all, they’re fun. One thing that ties all of these activities together is the simplicity. They’re all out-of-the-box ideas, but none of them require expensive supplies or a lot of prep time. It’s so easy to pull everything together when your child brings home spelling words. 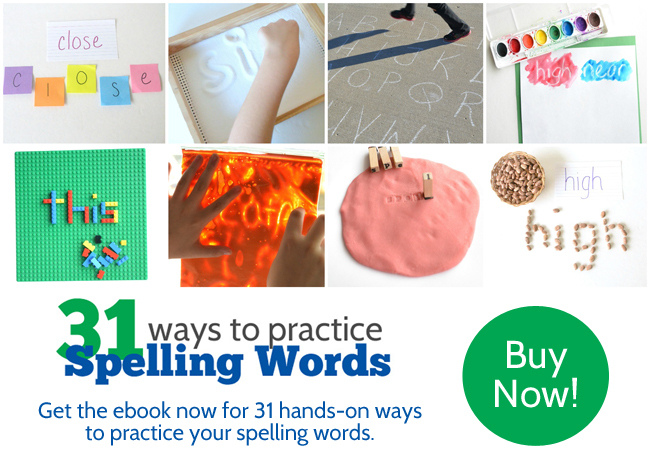 These ideas all versatile enough to work with any set of spelling words. Grab a stack of sticky notes and use them to spell your words. Spelling with Sticky Notes is always fun! Get out your bin of LEGOS and use them to build your words. 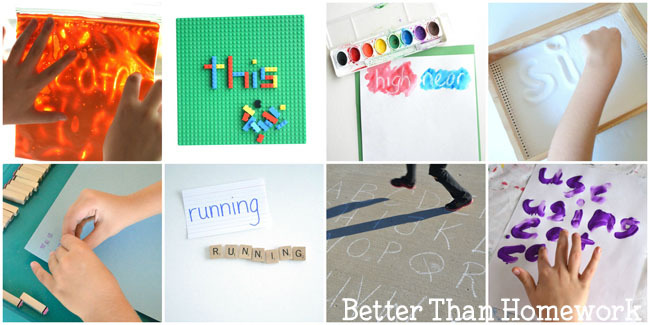 Sometimes you just need to move, and when that happens, you can spell your words on a driveway letter grid. 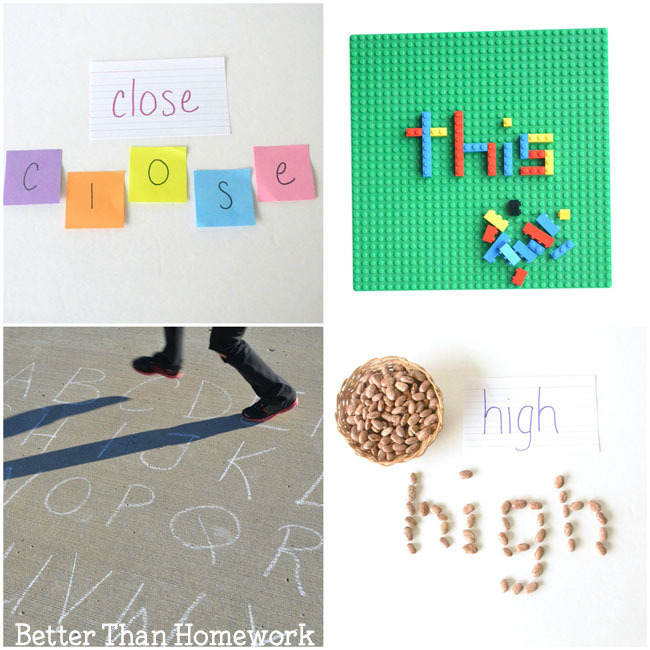 Add a bag of dry beans to your learning supplies and you can build your words with dry beans anytime. Keep a salt tray available and you’ll always be able to practice your spelling words with salt writing. Grab a set of letter stamps and spell your words that way. 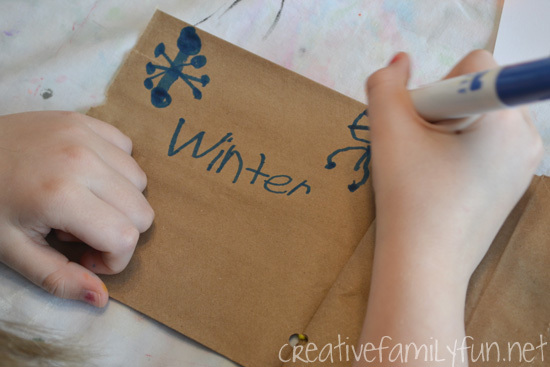 Make up some paint in a bag and use it to write your words. 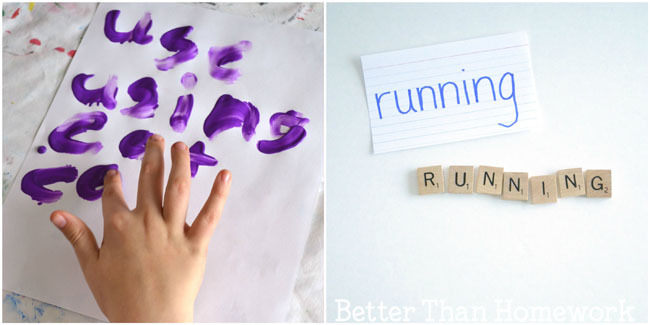 Combine spelling with art and create some watercolor resist spelling words. 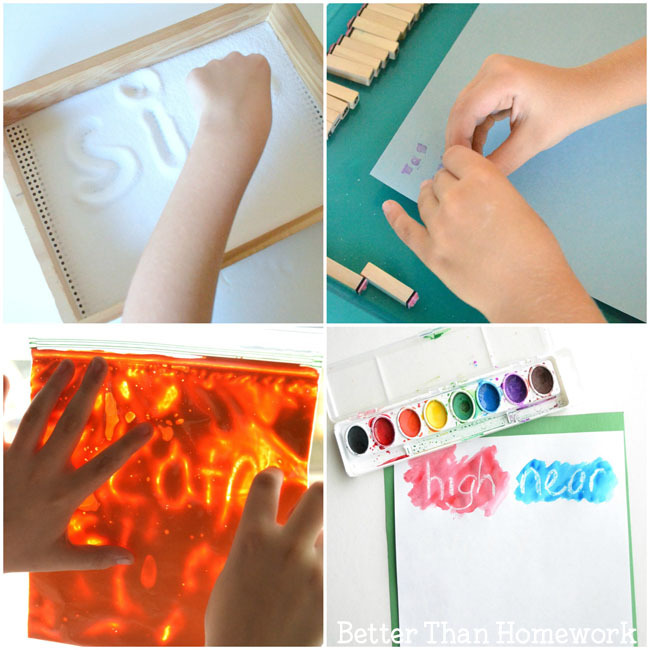 Find a tub of paint and finger paint your spelling words. Grab the tiles from a game and spell your words with Scrabble tiles.